Homes in the Mound City Community are mounted to metal poles so they float in place during a flood. Mobile homes that could be moved were set up in a kind of refugee camp along the dry side of the levee. Settled on the River Side of the protective levees, Mound City and other communities were flooded under more than 12 feet of water in places despite being nearly three miles from the Mississippi River's main channel. Beside each floating structure are single-story homes, sheds and other structures hidden underwater, completely inundated by the flood. For miles west of the Mississippi River farmland became a massive lake for weeks. Here we have to duck to fit under an elevated irrigation system to paddle across what was a soybean field, now under more than 10 feet of water. 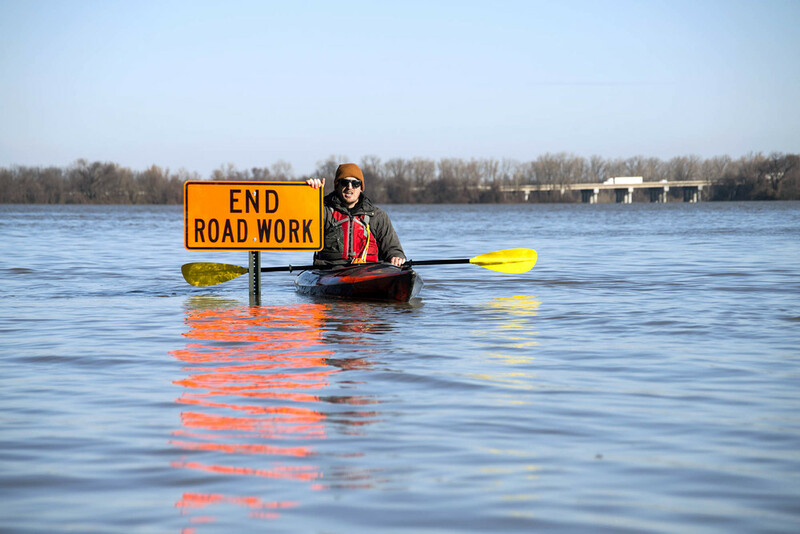 The flood waters of the Mississippi River nearly reach the bottom of the I-55 bridge, and two rail bridges crossing between Memphis and Arkansas. A construction zone where maintenance was being performed on a farm road is flooded in every direction.